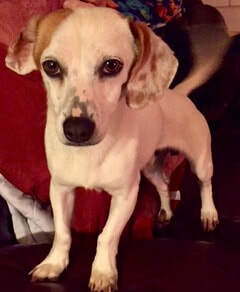 Jesse is approximately a 1 year old Doxie Jack Russell mix. He was brought to the shelter as a stray. Jesse has lived in my house for the last couple of weeks and I can tell you he is such a sweet, lovable, affectionate dog. He learns quickly and just wants to please. He has had some classes in obedience training and does well, but through no fault of his own, I don’t have the time to practice with him as much as I should. Jesse has learned the doggie door and is perfectly housebroken as long as he can get in and out on his own. He hasn’t had an accident in the house since the first day I brought him here. Jesse loves to play with the water from the hose and will get himself very wet if you let him. He’s such a clown and so much fun to watch him enjoying himself. Jesse was very thin when I brought him home but has filled out nicely and really enjoys his meals and snacks. The biggest thing Jesse needs is a young active playmate. My dogs are all older and they do not want to play with him. He tries so hard to get them engaged but they aren’t having any of it. If you have a young smallish dog that needs a playmate, please consider Jesse. He would just love to have another dog to romp with and he enjoys his walks. Jesse is energetic and would be a great dog for agility training. He’s not overly active and does spend a good part of the day sleeping as most dogs do, but he is young and has more energy than my older dogs. Jesse is neutered, up to date on shots and micro chipped. For more information on Jesse feel free to e-mail me at doxykeeper@me.com or call 661 943-4888. 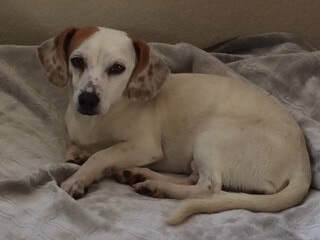 An approved application is required for Jesse's adoption.